Since I was a child, I have been going down to the South Jersey Shore several times every year for the past 34 years now. I have been to Atlantic City a few times however, I have never been down to the Jersey Shore in the wintertime to see what snow looks like on the beach. 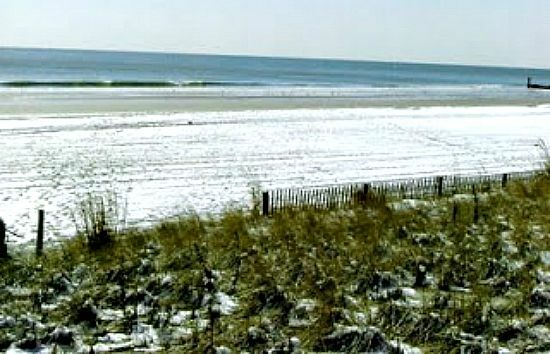 My hubby and I took a brief trip down to Atlantic City New Jersey back in February 2008 and I was finally blessed with seeing what snow looks like on a beach! This was something on my "to do list" for the past few years and a travel goal that I wanted to accomplish. 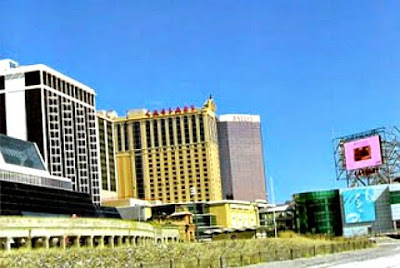 We stayed at the Trump Marina Hotel owned by (you guessed it) The Donald! If you are looking for some travel deals, visit some of the major hotel websites for Atlantic City and sign up for their email lists. They send a lot of special offers and discount coupons to you via email. Our hotel was beautiful and sat right on the edge of the bay. Atlantic City also has a beautiful lighthouse for the lighthouse fans like myself called Absecon Lighthouse which I will blog about and show some pictures in another blog post later this week. 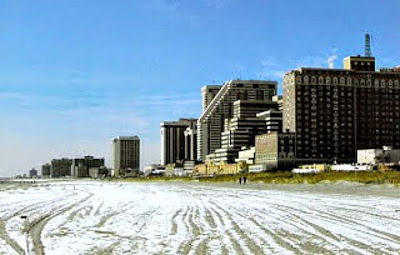 Atlantic City is not one of my favorite places to go when I am down at the Jersey Shore since I am not much of a gambler, but every few years we like to visit AC just for a little fun or to see what has changed. I remember staying at the Don's place and splashing my face with the bidet to show you! LOL. It was lovely spending some time with my dear friends. Wish it had been longer.